P504S/AMACR is a rabbit monoclonal antibody derived from cell culture supernatant that is concentrated, dialyzed, filter sterilized and diluted in buffer pH 7.5, containing BSA and sodium azide as a preservative. Store at 2 to 8 degree C in the dark. Small volumes of anti-AMACRacemase antibody vial(s) may occasionally become entrapped in the seal of the product vial during shipment and storage. If necessary, briefly centrifuge the vial on a tabletop centrifuge to dislodge any liquid in the container`s cap. Certain products may require to ship with dry ice and additional dry ice fee may apply. AMACR (P504S) is an acronym for the protein alpha-methylacyl CoA racemase that helps to metabolize certain fatty acids within the body. AMACR has been recently described as a prostate cancer-specifi c gene that encodes a protein involved in the beta-oxidation of branched chain fatty acids. Expression of AMACR protein is found in Prostatic Adenocarcinoma but not in benign prostatic tissue. It stains premalignant lesions of the prostate: High-Grade Prostatic Intraepithelial Neoplasia (PIN) and Atypical Adenomatous Hyperplasia. 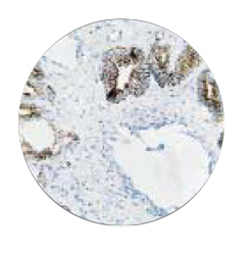 Several studies have suggested that AMACR can be used as a prostate cancer biomarker.High expression of AMACR (P504S) protein is usually found in Prostatic Adenocarcinoma but not in benign prostatic tissue by immunohistochemical staining in paraffin-embedded tissues. Using AMACR as a positive marker along with basal-cell staining (34betaE12 or p63) as a negative marker could help to confirm the diagnosis of small foci of Prostate Carcinoma on needle biopsies. NCBI/Uniprot data below describe general gene information for AMACRacemase. It may not necessarily be applicable to this product. Function: Racemization of 2-methyl-branched fatty acid CoA esters. Responsible for the conversion of pristanoyl-CoA and C27-bile acyl-CoAs to their (S)-stereoisomers. Catalytic activity: (2S)-2-methylacyl-CoA = (2R)-2-methylacyl-CoA. Pathway: Lipid metabolism; bile acid biosynthesis.Lipid metabolism; fatty acid metabolism. Subcellular location: Peroxisome. Mitochondrion Ref.1. Sequence similarities: Belongs to the CaiB/BaiF CoA-transferase family. Sequence caution: The sequence ACL67853.1 differs from that shown. Reason: Aberrant splicing.The sequence ACL67854.1 differs from that shown. Reason: Aberrant splicing.The sequence CAB44062.1 differs from that shown. Reason: Frameshift at positions 62, 65 and 114. 1. A combination of high molecular weight cytokeratin and alpha-methylacyl CoA racemase is of great value in combating the morphologically suspicious cases and significantly increasing the diagnostic accuracy in prostate cancer.